The RM8 family are versatile high-performance, long distance strategic and maritime data communications products to use with H/V/UHF transceiver equipment. The RM8 WBHF data modem operates with wideband HF radios having an audio bandwidth exceeding the traditional 3 kHz (SSB) & 6 kHz (ISB) bandwidths. Data is transferred at rates of up to 120 kbps over WBHF radios supporting bandwidths up to 24 kHz. 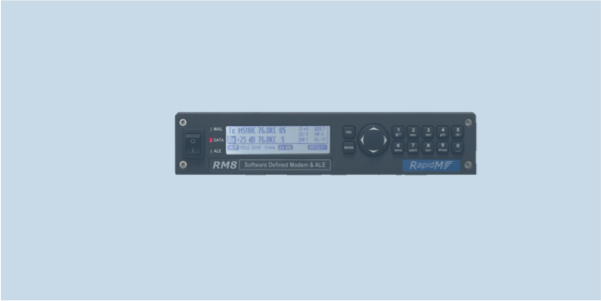 The RM8 interface is via a 24 kHz baseband audio interface.